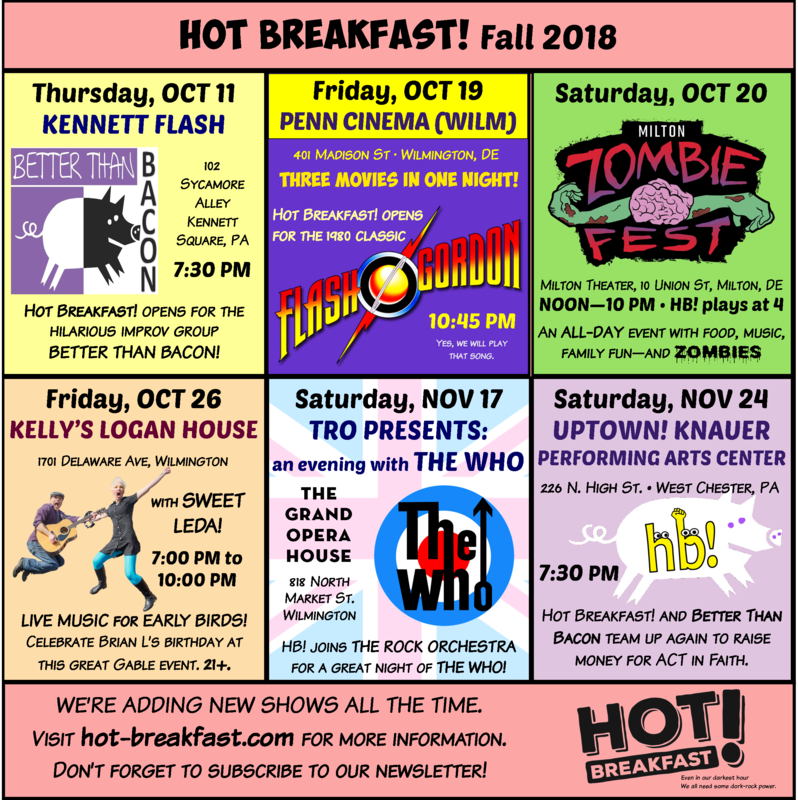 The Diner Placemat of our Fall 2018 Gigs – Hot Breakfast! We’ve got a bunch of gigs happening this fall! Whee! This Thursday, October 11, 2018 at 8:00pm: A Night of Silliness with Better than Bacon Improv at The Kennett Flash (Kennett Square, PA)! Family friendly (PG)! If you like the show Whose Line Is It Anyway, then you’re familiar with improvisational comedy. Better Than Bacon was voted Chester County’s best improvisational comedy troupe, and we are sharing a bill with them this Thursday night! They make up every single word and perform every single action completely on-the-spot…and it’s all driven by YOUR suggestions. And don’t worry, we’ll get you home in time to catch the end of the Eagles game, and we’ll be giving game updates throughout the night. (We have everyone’s best interests at heart.) Doors open at 7pm, Music at 8pm. BYOB. Click here for tickets and info from the venue. Click here for the Facebook Event. Click here for info from our website. FRIDAY, OCTOBER 19th 11:00PM: Monsters & Malts Film Festival, Penn Cinema on the Riverfront, Wilmington, DE. We play right before the screening of Flash Gordon. There’s a three-night film festival at Penn Cinema on the Riverfront (the 18th, 19th, and 20th), where beers are paired with screenings of classic fun spooky movies like Nightmare on Elm Street, E.T., the original Ghostbusters, and more! We’ll be playing right before the screening of Flash Gordon on the 19th. All ticket proceeds for the Flash Gordon screening goes to the Food Bank of Delaware. The doors open at 10:45, beers and music start at 11pm, and the movie itself starts at 11:30pm…. and yes, we’ll be playing that song. Click here for tickets and info from the venue. Click here for the Facebook Event. Click here for info from our website. SATURDAY, OCTOBER 20th, 4PM: The Milton Zombie Fest in Milton, DE! There’s music and fun activities all day; we play at 4pm. Family friendly! Spooky, silly, fun, boozy, and undead family-friendly fun times are afoot in Milton, Delaware on Saturday the 20th, for an all-day Milton Zombie Fest, complete with food trucks, vendors, makeup stations for all the hottest undead makeup looks, a beer tent, zombie pirates, a Zombify Your Vehicle Contest, a screening of Rocky Horror Picture Show, and a zombie walk/trudge at 8:00pm! Tons of really great live music, plus one totally mediocre band (heh). Bring your own chair/blanket! The event runs from 12Noon to 10:00pm; We play at 4pm. Click here for the Facebook Event. Click here for info from our website. FRIDAY, OCTOBER 26th, 7PM: Hot Breakfast and Sweet Leda at Kelly’s Logan House in Wilmington, DE — Live Music for Early Birds. We’ve been asked to join the bill for a very special birthday edition Live Music for Early Birds at the Logan House. Come celebrate Brian’s birthday, or just come hang out even if you don’t know who Brian is. This show is part of Gable Music Venture’s “Live Music for Early Birds” music series, which books bands in the 7-10pm slot, so the young’uns can still go out and get their drinky-dancey on, and we old farts can be home in time for Matlock and Metamucil. Everyone wins! Music starts at 7pm sharp! Click here for the Facebook Event. Click here for info from our website. SATURDAY, NOVEMBER 17th, 8PM: The Rock Orchestra presents the music of The Who, at The Grand Opera House, Wilmington, DE. Fresh off of their hit success of BeatleFest, The Rock Orchestra begins their year-long residency at The Grand Opera House with an evening of the music of The Who, for one night only. While not an official Hot Breakfast! show, we have been recruited to be part of this awesome tribute to The Who, with Matt and Jill providing tons of backing vocals and horns and percussion. Come see Jill actually play the trumpet for real! Doors open at 7:30; Music at 8pm. Click here for tickets and info from the venue. Click here for the Facebook Event. Click here for info from our website. SATURDAY, NOVEMBER 24th, 7:30PM: Hot Breakfast teams up with Better than Bacon Improv for BACON GIVES BACK: A Fundraiser at the Uptown! Knauer Performing Arts Center in West Chester, PA. Family friendly! Hot Breakfast! teams up with Better Than Bacon Improv to raise money for ACT in Faith of Greater West Chester. They are a non-and-multi-denominational charity that pools their resources to provide much-needed services for the community. No matter your religious (or non-religious) leanings, you can feel good about spending your time and ticket fee on this event. Doors open at 7pm; Show starts at 7:30. Click here for tickets and info from the venue. Click here for info from our website. Would you rather just use our Google Calendar? Click here.